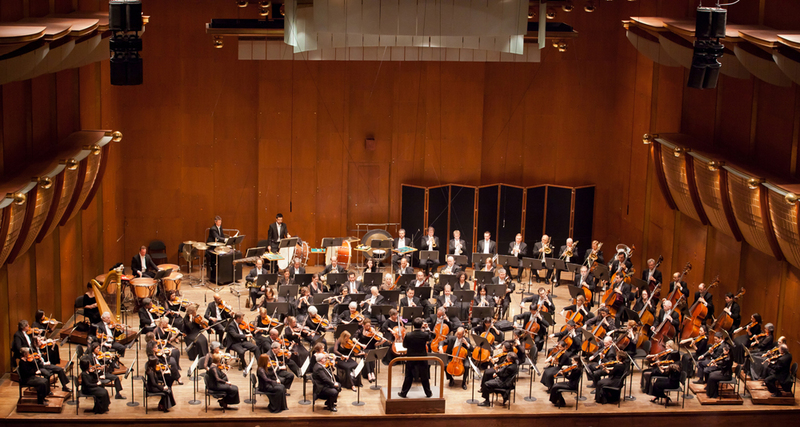 I have been thinking generally about how orchestras define themselves and, specifically, about what the New York Philharmonic means to the public we serve. Last week’s Philharmonic production of The Cunning Little Vixen was a joy to work on, and I am hugely proud of what we achieved as an institution. For the last month or so, our various departments banded together and effectively functioned as a top-notch opera company. Hallways became costume and prop storage areas, people could be heard discussing the story and meaning of Janáček’s masterpiece, and the buzz of activity with its unifying force was truly gratifying. The experience we had last year with Ligeti’s Le Grand Macabre was helpful — we certainly learned a lot that came in handy this second time around. But, at the same time, the bar had been set so high by the enormous triumph of the Ligeti that I think we all felt real pressure to have a great success. Many of the previews in the press openly wondered, ”Can they do it again?” and ”Will lightning strike twice?” On a personal level, I was hoping to provoke a response that would justify the unusual commitment that presenting a staged opera demands of the Philharmonic. It worked. 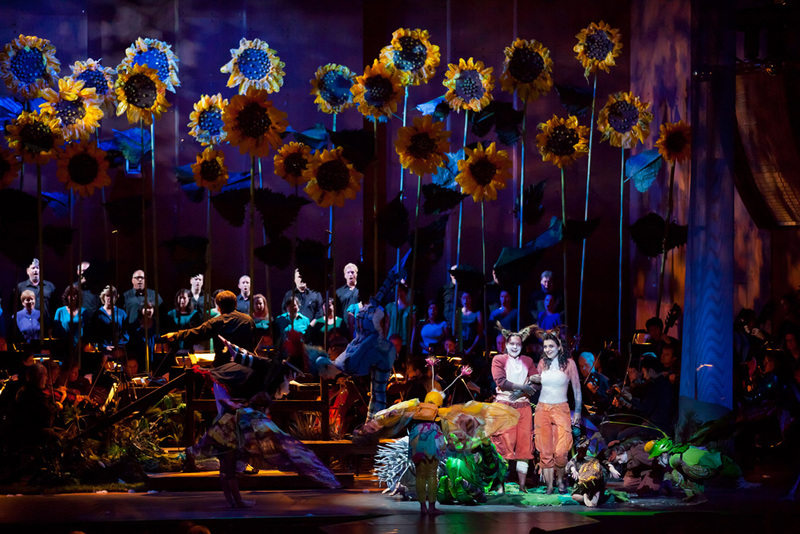 Reactions were overwhelmingly positive, and many opera buffs even said that they felt that we achieved a greater-than-usual emotional power with Doug Fitch’s enchanting production of Vixen. 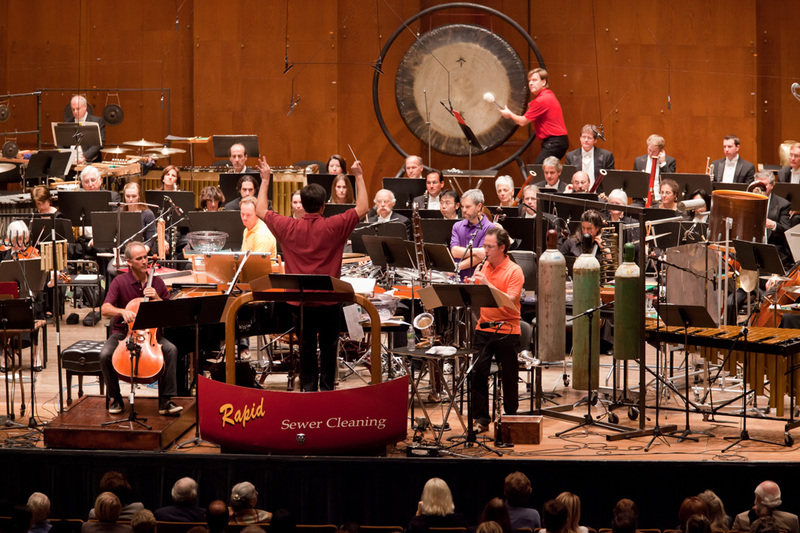 I am sure that the unexpected and non-traditional setting was largely responsible for this — as soon as one entered Avery Fisher Hall one felt a fresh sense of possibility that naturally comes along with the unexpected. Who had ever seen a huge grove of sunflowers sprouting among the musicians of the New York Philharmonic? What was most gratifying, however, was the response to the Orchestra’s playing. Each night the ovations were the loudest when the musicians stood. 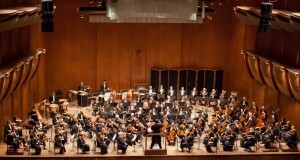 Of course, my choice of this particular opera was largely influenced by the prominent role that the orchestra plays, but the combination of hearing the New York Philharmonic play this ravishing score, with its range of opulence and shimmering tenderness, and of actually seeing the musicians on stage had to have been extremely powerful in inspiring this reaction. 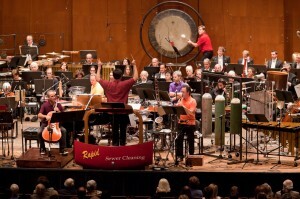 It felt like a new paradigm not only for opera, but also for orchestras. Why shouldn’t we do away with the artificial boundaries that separate art forms? Last week more than one audience member came backstage after a performance of Vixen to tell me that the applause for the Orchestra and for me was not only for that night’s performance: it was also for our vision, and for what this Orchestra is coming to mean for New York City. All of us on stage sense this as well. We feel the support and connection with the audience that is based on this identity — an identity that is, after all, at the very core of our aspiration to be, in the deepest, most meaningful way, New York’s own Orchestra. This entry was posted on Tuesday, June 28th, 2011 at 9:24 am	and is filed under Curiously Random. You can follow any responses to this entry through the RSS 2.0 feed. Both comments and pings are currently closed.